HARRISBURG - The cash-strapped Pennsylvania Department of Transportation is placing weight restrictions on 1,000 bridges across the state, including 134 in the Southeast, in an effort to prolong their use. "The bridges are not unsafe," Transportation Secretary Barry Schoch said at a news conference Thursday. "We are trying to slow down their deterioration." Schoch was making good on his promise several months ago that action would have to be taken to protect motorists and preserve aging bridges if the legislature failed to approve a multibillion-dollar transportation-funding package. "For months, I've been explaining to Pennsylvanians and to lawmakers that there are very real consequences to not enacting a transportation-funding plan," Schoch said. "Without additional revenues anticipated in the future, I have to make the safe and responsible decision to reduce how much weight is crossing these deteriorating bridges." Of the 1,000 bridges, half are state-owned, the others locally owned. Many date to the mid-20th century or earlier. 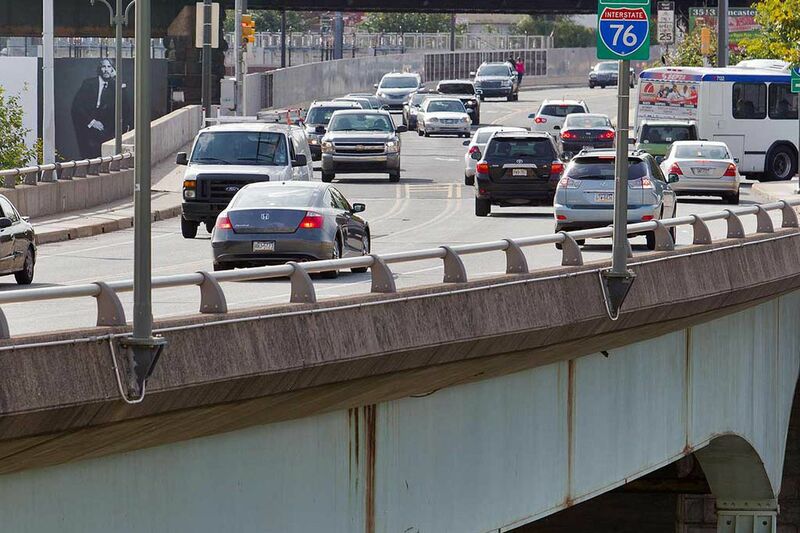 Pennsylvania has 4,479 structurally deficient bridges, the most in the nation. The five affected bridges in Philadelphia are Spring Garden Street over the Schuylkill and Martin Luther King Drive; Erie Avenue over the old Conrail line; Frankford Avenue over Frankford Creek; City Avenue over the SEPTA tracks; and 34th Street over the CSX tunnel. The restrictions will not affect cars and light trucks, but could cause increased congestion elsewhere as larger commercial vehicles - including school buses and, in some cases, ambulances - are rerouted. As a result, ambulance patients might have to wait longer, and students in some areas might have to endure longer bus rides to school, Schoch said. PennDot will phase in the bridge-weight restrictions over the next five months. The agency did not release specific weight limits because some have not yet been determined and the weights will vary by bridge. The news comes one month before lawmakers are scheduled to return to Harrisburg to again try to tackle a transportation-funding package that failed to win passage in the spring. The finger-pointing resumed in earnest after Schoch's announcement, with House Republicans blaming House Democrats for the inaction, and House Democrats blaming Gov. Corbett. Before breaking for the summer recess, the Senate approved a bill that would have generated $2.5 billion a year for roads, bridges, and transit, but the measure failed to pass the House. Corbett's transportation plan was a more modest $1.8 billion. Both plans rely primarily on a gradual increase in the wholesale gas tax over several years. Steve Miskin, spokesman for House Republicans, said the release of the restricted-bridge list has given lawmakers a better handle on the scope of the problem. "Now we have a defined problem, and we can focus on the critical needs of Pennsylvania's infrastructure," Miskin said. Schoch said the weight restrictions would go into effect regardless of the legislature's actions. Contact Amy Worden at 717-783-2584 or aworden@phillynews.com, or follow on Twitter @inkyamy.